Vault of Light: A week of winning! I've had a pretty good week in WoW. Neri over at Neri Approves hosted a trashy transmog competition asking readers to send in a screenshot of their trashiest transmogrification. 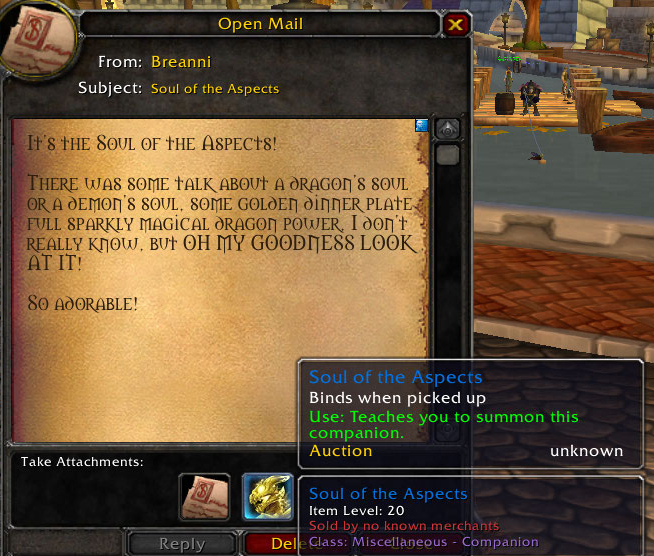 She announced that the three people with the highest votes would win a Soul of the aspects pet. I stumbled upon the competition a bit late but I decided to enter with my little Protection Paladin wearing the Saltstone set. I'd managed to pick up a couple of pieces from the Auction House at ridiculous prices, justified only by the fact that I'll be able to keep the set forever. A long term investment, yeah, that's right. I think the idea of skimpy armour is hilarious, especially on tanks. Low and behold I won. I've never won anything before (albeit I've never entered anything before but still.) I was stoked! I wanted this pet when it was first released but I don't really want to buy any of the pet shop pets. I've given Blizzard enough money over the years from transfers and faction changes, besides I'm a total cheapo. If that wasn't enough the WoW Factor visited the EU for the first time last night on the Chamber of Aspects server. Nev from Auction House Addict sponsored the event with 100 thousand gold which was given away to participants! I had a level 74 Priest knocking around on the server so I decided to tag along. I've been waiting for these events to come to the EU since they started so I was super excited! I took some screen shots during the event. Have you been lucky enough to have a WoW factor show on your server or have you ever thought of setting up your own fashion show? I'd love for them to come to my main server! If you would like to sponsor an event on your server you can contact the WoW Factor crew. I grabbed a couple of items from the Auction House and threw together a quick outfit. I had no intention of actually participating but while I was away getting a drink I got a whisper asking me if I'd like to be judged and to stand in line. I won three thousand gold! Not bad for just turning up. There were a couple of great entries. The event wasn't that huge due to it CoA being a fairly small server but it was fantastic seeing the community come together to join in. We even had a visit from the Horde! The Horde who came along were also judged which was a nice surprise one of them even won five thousand gold (traded across the neutral auction house) how awesome is that? Congrats on winning the trashy contest! I really like your outfit and also on your WoW factor win. We had a WoW Factor like show on my main server at the end of April. I managed to walk away with 5K. Congratulations on the 5K that's awesome! I'm thinking about sponsoring them to come to my main server. It's very much larger than the server the visited so it should be fun, but with mop coming I'm not sure I want to drop the money quite yet haha.